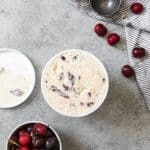 Homemade Cherry Vanilla Ice Cream made with fresh cherries, heavy cream, milk, sugar, egg yolks, and vanilla is one of the best indulgences of the summer! In a small saucepan, bring the sugar, water and cherries to a boil over medium-high heat, then reduce the heat to a gentle simmer. Cook until the cherries are soft, about 5 minutes, then remove from the heat and let the cherries cool completely in the syrup. When cool, drain the cherries and squeeze out the pits, then chop the cherries into small 1/4-inch pieces and refrigerate until ready to add to the churned ice cream. The syrup can be saved to drizzle over ice cream, swirl into club soda, or add to lemonade where it calls for a simple syrup. Heat half of the sugar, cream, milk, and salt in a saucepan over medium-high heat until the mixture approaches a bare simmer, then reduce the heat to medium. Meanwhile, in a separate bowl, whisk the egg yolks with the remaining sugar until light. When the cream mixture is hot, temper the eggs by whisking 1 cup of the hot liquid into the egg yolks, then add this to the rest of the hot cream mixture in the saucepan. Cook, continuing to stir, just until the mixture reaches 175 degrees F on a candy thermometer and is thick enough to coat the back of the spatula or wooden spoon and holds a clear line when you run a finger along the back of the utensil. Chill completely before adding the vanilla, then churning the ice cream according to your ice cream maker's instructions. Add the chopped cherries in the last minute of churning or fold in using a spatula once the ice cream has churned. Transfer to a container and freeze for 4 hours until frozen hard. Adapted from the Bi-Rite Creamery cookbook Sweet Cream and Sugar Cones.